(LWI) - When dawn broke on the first day of 2017 on the remote Chatham Islands, 700 kilometers east of mainland New Zealand, 40 Lutherans gathered to worship and welcome the year of the 500th anniversary of the Reformation. “You are invited to be here with us as we begin a whole year of commemoration and celebration of God’s reforming grace and love,” Bishop Mark Whitfield said at the inaugural event by the Lutheran Church of New Zealand (LCNZ). Several months later, the church has organized ecumenical services, tree planting, films and lectures in all its major centers and more activities are planned. The beginnings of the Lutheran church in New Zealand date back to February 1843, when five Lutheran missionaries from the Gossner Mission in Berlin, Germany, arrived on Chatham Islands or Rehoku to serve among the indigenous Moriori people. With just 800 baptized members in a population of 4.5 million, the LCNZ has undertaken an impressive number of Reformation anniversary events, both nationally and locally, Whitfield says. “We’re doing our best, with limited numbers, resources and capacity to ensure that New Zealanders are aware of this commemorative year, and most importantly, of the gospel that lies at the foundation of the Reformation,” he adds. 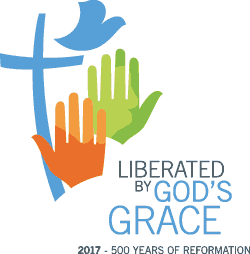 In June the LCNZ biennial convention in Wellington set aside one day to commemorate the anniversary with ecumenical worship and a Reformation dinner. A joint service was held in the Roman Catholic Cathedral in the capital city, hosted jointly by Cardinal John Dew and Bishop Whitfield. An important outcome of this initiative was the establishment of the first Catholic-Lutheran dialogue in New Zealand. A few days before Reformation Day in October, Whitfield will preside at a Lutheran Vespers that will take the place of Evensong in the Anglican Cathedral in Wellington. During the service the cathedral choir will present Johann Sebastian Bach’s Reformation cantata of Eine feste Burg [A Mighty Fortress], one of the best known hymns by the reformer Martin Luther. The Lutheran World Federation (LWF) has invited its member churches around the world to mark the anniversary that has spawned all variety of commemorations. This August, LWF General Secretary Rev. Dr Martin Junge witnessed some of these activities, during his visit to the LCNZ and the Lutheran Church of Australia (LCA). The LCNZ is a district of the LCA, an associate member church of the LWF since 1994.